Dark Mouse at Albero Gatcha Festival! Hey! I hope you’ll stop by the Albero Gatcha Festival, I have a little item there – along with a ton of other items from some pretty cool designers. 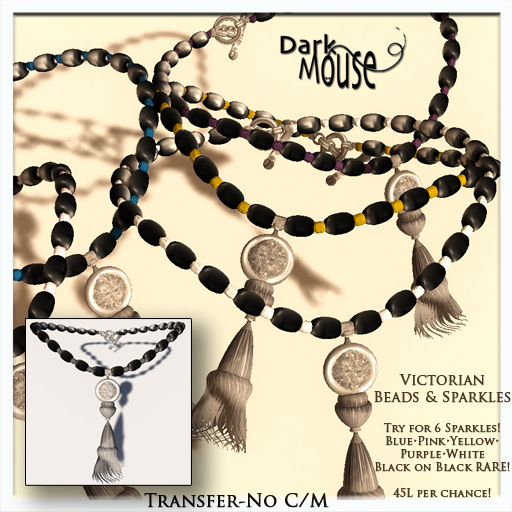 My item is a lovely vintage style necklace – Victorian Beads & Sparkles. You get a random necklace and sparkle combination for only $45L per try. The necklaces are transfer, so you can trade with a friend. Good luck! Here’s a taxi to the event – click this link. 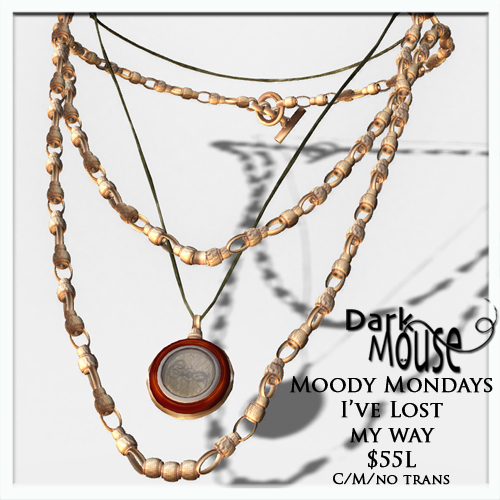 I’ve got an item in the Moody Mondays sale this week, I hope you’ll stop by and take a look – at mine and all the other wonderful vendors in the sale! My item is called, “I’ve lost my way” and is a boho kind of look with a compass (get it?) as the main point. Here’s a teleport to my main store.